As soon as the colder weather hits, I tend to retreat to a world of block colours. Bye prints! However, having seen endless streams of strikingly bold prints hitting shops and runways alike, I've been persuaded to at least dip my toe into the pool of prints this Autumn. If, like me, you go all out with florals/stripes/gingham in summer, and then regress to only monochrome looks from September onwards, now is the time to experiment a little. Just a tiny bit. To start with? Heritage Check. It's bold and yet subtle if wanted, pretty yet powerful and ideal for wearing from desk-to-date, and day-to-night! If a full-on blazer doesn't sit comfortably with you (yet), the next best option is to opt for trousers; look for a heritage fabric with contemporary silhouette. Honestly? They're popping up everywhere you look right now, and so won't be hard to find - but I've linked a few below anyway! 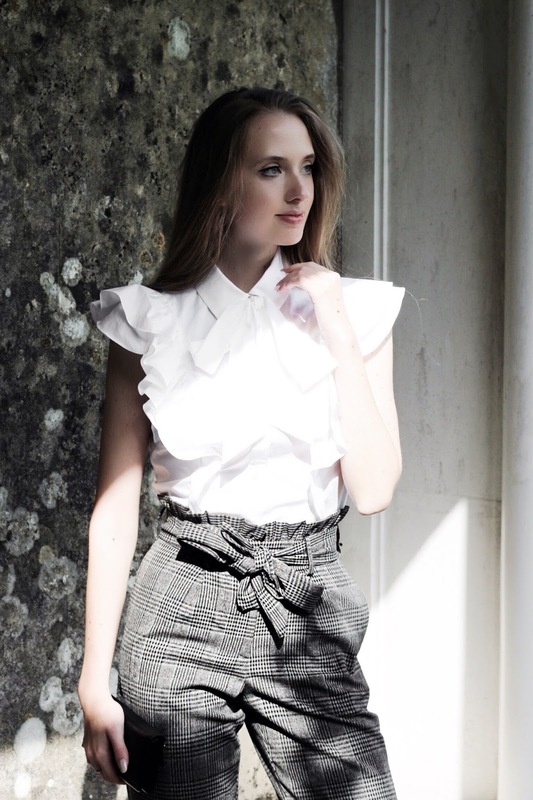 Not gonna lie, I'm loving the country vibe that heritage checks offer, it's so much fun to counteract with contemporary pieces, like this ruffle shirt (or other classic-but-statement shirts shared last month!) and maroon fur sandals. It's because of this the print makes an ideal choice for taking from desk-to-date, and from day-to-night; checks blend in with their surroundings, depending on how you style them. I've been crushing on so many street style looks lately, with the very top of the list being identical trousers to these paired with fishnet socks and patent loafers. Dreamy! 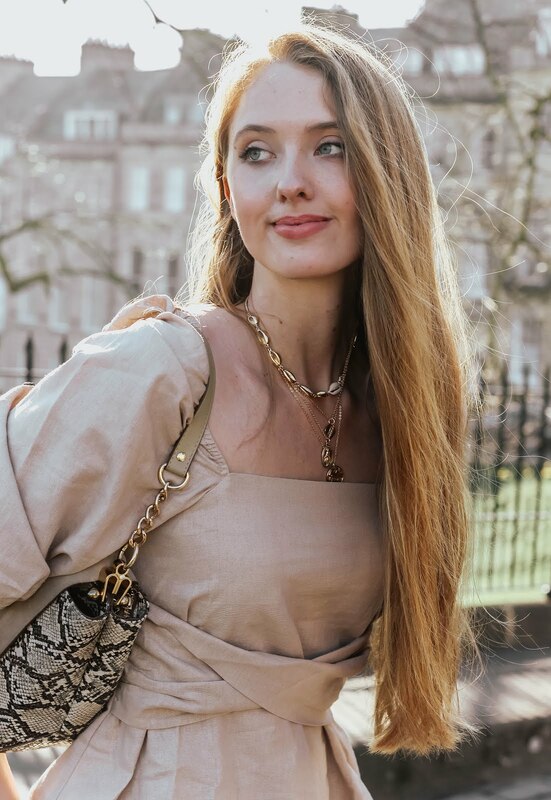 This has to be one of the easiest Autumn wardrobe-updates of all time, and so much fun to play around with too. Have you brought this chic print into your wardrobe yet this season? As always, looking forward to hearing your thoughts on the styling! Love it, hate it? Let me know! Perfect this look with the paperbag pants! Those pants with that shirt are such a killer combo! oh Gabrielle you look stunning with this high waisted pants and the very girly white top! Also the killing heels are adorable. definitely in love with the contrast! You look gorgeous Gabrielle in this outfit!Loving that ruffle top! This is perfect! I love the entire combination! I’m in love with those pants & those shoes are the coolest! A great desk to date kinda outfit! Heritage checks are so classic and autumnal! 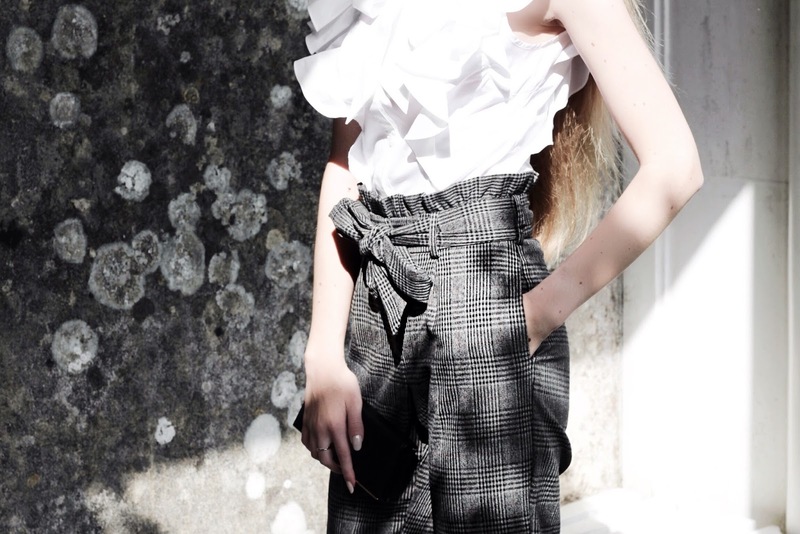 Your trousers are just the perfect addition for the new season Gabrielle. I love the how the paperbag ruffled waist and bow tie detail counterbalances the menswear vibe of the plaid. this is the perfect print for fall! and with those fluff heels, absolute perfection! I have been looking for new work trousers and have a similar pair sitting in my basket online. I am not sure if I can style them versatile enough? Chic and class from head to high heels ;) A superb outfit! I'm in love with this outfit, the trousers are simply perfect! Those pants look so good! I love the way they tie and the top is gorgeous. I absolutely love this outfit on you, Gabrielle! The cropped trouser looks really good on you and I have been searching one for myself too but so far none look good on me. The search continues! You look so incredibly gorgeous and ready for fall in this ought, girlie! I love the pants, which fit you perfectly and the print looks fantastic paired with those gorgeous burgundy shoes, which I'm swooning over! Great styling, gorgeous, and I hope you're having a great start to your week so far! I love this look- these trousers are so good, babe! totally in love with your outfit! i love those pants! I've been seriously loving this print lately, both on trousers and a good oversized blazer. I don't own any pieces myself (yet), but I'm definitely looking! Perfectly styled! Love the combination of different textures in this look, beautiful! I’m so ready for fall and a little color blocking. It’s good to know that prints are still rocking the runway. I’m loving these pants but your shoes are to-die-for!! This is the perfect fall for desk to date look. I love the paperbag waist on these pants! I only have printed jeans, I'm definitely lacking printed pants in my wardrobe but I find them so hard to buy being petite. I always say I want to buy more every winter but never find a pair - didn't find any to buy this winter either! Absolutely stunning photos! You are such a model, Gab. Perfect figure and perfect face! I love love the effects on your photos ! And theses pants are just amazing for autumn. It so lovely with your ruffle blouse. I really love everythings about this look. Loveeee! Perfect for the office! This entire outfit suits you beautifully Gabrielle, I really adore the cropped trousers and how the bow on them compliments the beautiful shape on the shirt you're wearing. You've paired this look together very nicely and look absolutely gorgeous. A very chic look and perfect office attire or a day out outfit. The sandals are so pretty and add a fun twist to the overall look! You look beautiful and this outfit is exceedingly figure flattering on you! Gabrielle, I LOVE these pants on you! You look so elegant as always! Absolutely in love with this outfit! You are pulling it off, girl! Such an edgy look, I love the top. Those fur sandals are just gorgeous! Love everything about this outfit (particularly those gorgeous heels!)! The trousers are so stylish too - you look fab! Love your outfit. The print is so lovely! Super love this Autumn look, clean, elegant and classy! You look so lovely!!! I'm suuuper picky about pants as I'm so much more comfortable in skirt and dresses, but when they're exactly the right cut they're so versatile and I can't stop wearing them cause they're so easy. I love the little ruffle around the waistband, I've been seeing that around and think it's such a cute detail that makes the pants slightly more feminine and I really like that.